After his Jena study years and short episodes in Leipzig and Naumburg, the twenty-five-year-old Ernst Wilhelm Wolf set out for Italy, not knowing that his travels soon thereafter would take him to Weimar, where he arrived just before New Year’s Day 1761. Weimar, the residence city of the Duchy of Saxe-Weimar-Eisenach, increasingly established itself as the center of German classical literature during the years following 1772, and it was here that Wolf reached his professional destination. He became a central figure in Weimar’s music world during the second half of the eighteenth century above all in his post as court music director. During his tenure the court orchestra officially founded in 1776 advanced to the status of an efficiently operating ensemble. It was able to do so not least because of his role in initiating the formation of a music library easily competing with those of much larger residences. The instrumental music of Viennese classicism occupied a place of special importance in the library. In his own compositional oeuvre Wolf devoted himself most extensively to the string quartet or to the quartet for four stringed instruments among the chamber genres for more than one instrument. Here he succeeded in original fashion in combining the influences of various preclassical traditions with the impulses set in motion by Haydn and Mozart. His quartets include not only movements drawing on the type of the baroque trio sonata but also galant elements of dance character, slow movements of emotional depth, and movements displaying a classical periodic structure. The three quartets of the op. 3 series recorded here for the first time form the genuine high point in Wolf’s quartet oeuvre. His predilection for contrasts produced in harmonic and melodic design (chromaticism) and in compositional technique and instrumentation effectively and skillfully lends these compositions their special appeal. Die Streichquartette von Ernst Wilhelm Wolf sind unbedingt wert, entdeckt und gehört zu werden - zumal in einer so fulminanten Deutung, wie sie hier zu erleben ist. Rezensenten wiederholen sich ungern. Dass dies bei manchen Interpreten unvermeidbar ist, gehört zu den positiven wie den negativen Erscheinungen des Metiers. 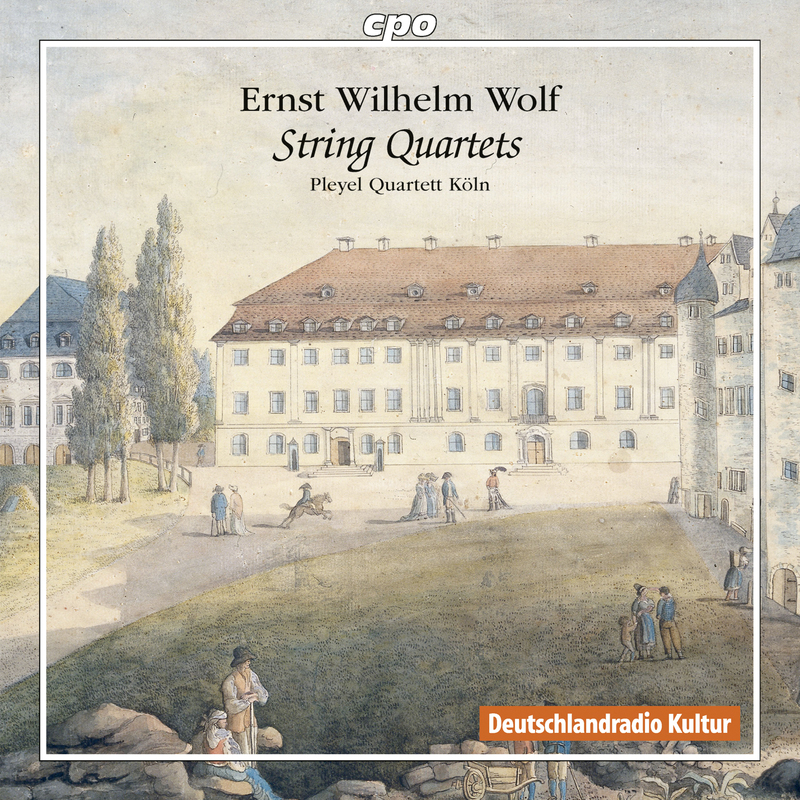 Die vorliegende CD mit Kammermusik des mir bis dato unbekannten Ernst Wilhelm Wolf (1735–1792) reiht sich nahtlos in die Kette hochqualitativer Preziosen des Kölner Pleyel Quartetts ein. »…there is little doubt that if you appreciate Mozart and Haydn’s string quartets you will get along with these very well indeed. Nope, I had never heard of him either. As it turns out, Ernst Wilhelm Wolf is yet another of those prodigies and composers of the classical age, famous and sought-after in their time, whom history has nearly forgotten. Legend has it that he was recruited by Frederick the Great to succeed C.P.E. Bach at his court, but turned down the offer to stay in Weimar. Anyway, these string quartets are thoroughly enjoyable and are expertly played by the Pleyel Quartet, an ensemble that is doing much to help bring the work of neglected classical-era composers to light.